– John Ivison, Calgary Herald, November 16. In mid-November, Prime Minister Trudeau was in Singapore, meeting with Chinese Premier Li Keqiang, for the third leaders dialogue between the two countries. This followed on the heels of high-level ministerial engagements in China from the week before. It was an auspicious time for the meeting, as much speculation about the impact of the “non-market country” clause in USMCA (United States-Mexico-Canada Agreement, which will NAFTA) on Canadian trade with China has happened in the last several weeks. The results of the Leaders’ Dialogue? Not much. One analysis speculated that Trudeau’s goal was to mend relationships from the “thorny trade talks” that happened with China last year. Both Canada and China reaffirmed their willingness to negotiate a free trade agreement in the future, seemingly at odds with the clause in the new USMCA. However, the idea of starting with sectoral agreements instead of a full-blown comprehensive free trade agreement seems to be gaining more traction in Canada. • Canada eyes sweeping free-trade deal with China but remains open to sector deal (Saskatoon Star-Phoenix, November 21, 2018): International Trade Minister Jim Carr said that Canada “remains open to striking smaller sector-by-sector agreements,” but also says that a comprehensive deal is still on the table. • John Ivison: Trudeau has a chance to play statesman by bringing the U.S. and China together on trade (National Post, November 16, 2018): Ivison argues that Canada can play the crucially important role of mediating an end to the U.S.-China trade war. • Canada Goose pushes ahead with China expansion in a market overflowing with knockoff parkas (Vancouver Sun, November 23, 2018): this article says that the knockoffs might actually be an “effective marketing tool” in China. • The government of Alberta’s announcement of creation of a massive new provincial park system in the Big Horn area between Jasper and Banff national parks including a CD$40 million investment in backcountry and front country camping will help offset overcrowding in Alberta’s traditional destinations, which are over capacity in the peak summer months. The announcement comes on the heels of increased tourism from China across western Canada helped by the year of Canada-Chinese tourism and announcement at the Singapore Leaders’ Dialogue of continued cooperation in tourism. • An interesting deep dive on how the Chinese government uses stimulus in its economy. • This Globe and Mail editorial argues that the clause in USMCA that may prevent Canada from signing a comprehensive trade agreement with China is a “gift” from Donald Trump. This op-ed in the Toronto Sun has a similar argument. • Advancements on a number of issues were made between Trudeau and Li at the Leaders’ Dialogue, including reductions in marine litter and a “frank and open discussion” on human rights. This is unusual: China is rarely in the top five largest importers of Canadian wheat. • A pledge was made between China and Canada to double agricultural trade between the two countries by 2025 – but industry stakeholders argue that the governments have a lot of work to do on red-tape before that can happen. • Because of the trade war between the U.S. and China, once predictable trade of soybeans has been altered. • Canada’s Agriculture Minister, Lawrence MacAulay, said that Ottawa “will pursue a free-trade agreement with China,” which will be a boost to Canada’s agricultural industry. 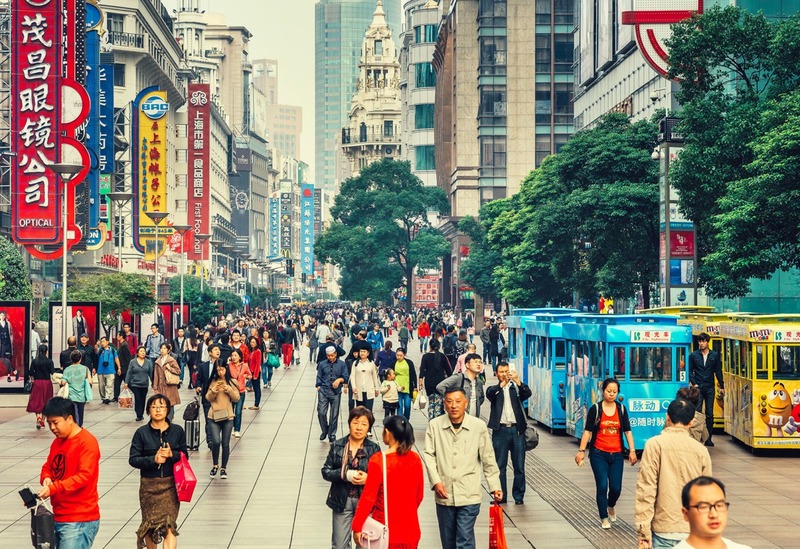 • China is struggling to control African swine fever on its pig farms – this article explores whether the fever can reach Canada. 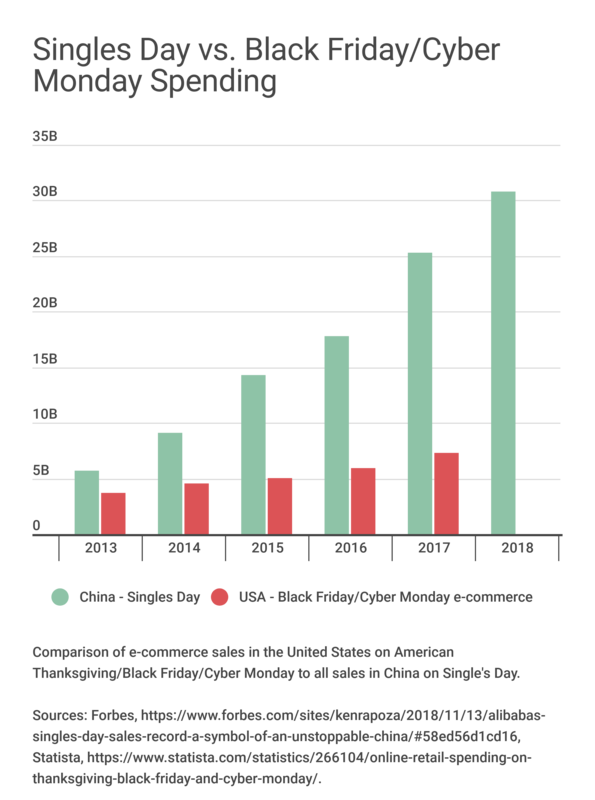 Black Friday sales got me wondering about how well sales compare in the United States and China between their two big sales periods: Singles Day in China (which is November 11), and the Black Friday weekend (and Cyber Monday) in the United States. • The New York Times has launched an interesting series on how China “wrote its own rules” to become the success that it is.